At Jarrods, we’re always inspired by our surroundings and we love seeing what people are doing to push the boundaries in the design world, particularly in the realm of staircase renovations. When we saw this copper wonder from Copenhagen, we were more than just a little impressed! 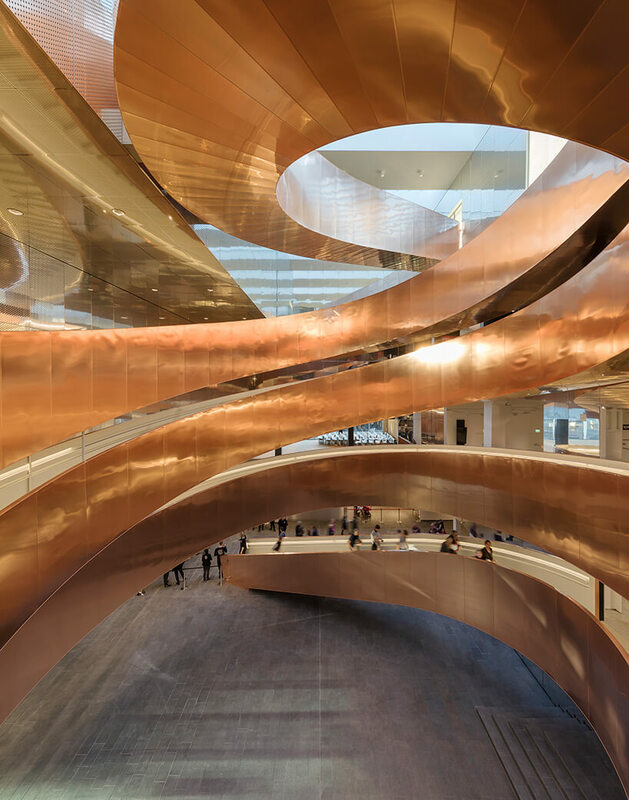 One of Denmark’s top science centres, the ‘experimentarium’, has recently opened its doors to proudly present a striking new interior with a stunning staircase taking centre stage. Designed by architecture firm CEBRA, the building now features a 100 meter-long helix staircase which dominates the atrium of the building. 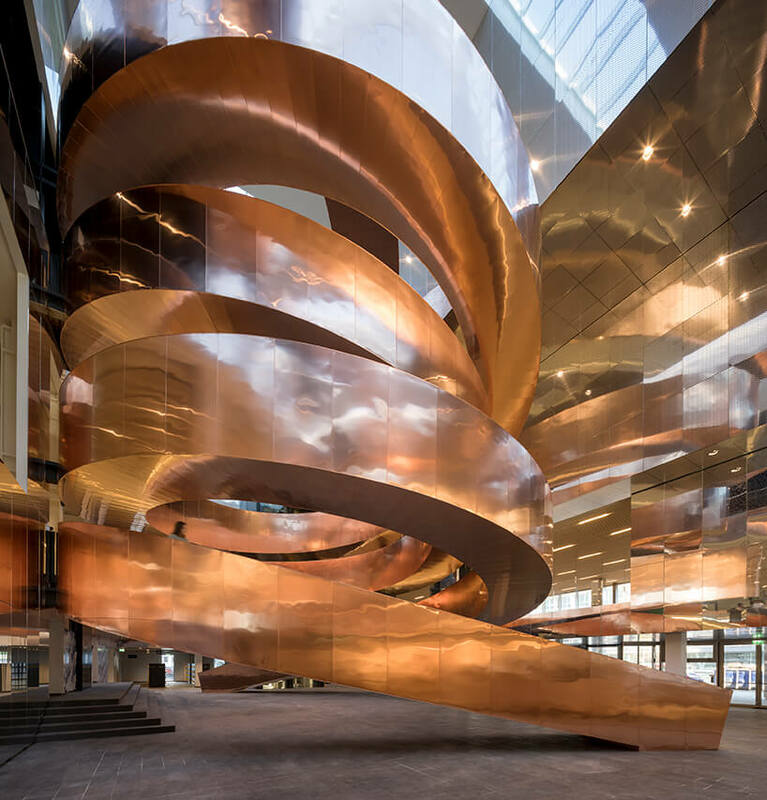 The breathtaking staircase has been built using 160 tonnes of steel and clad with 10 tonnes of copper. 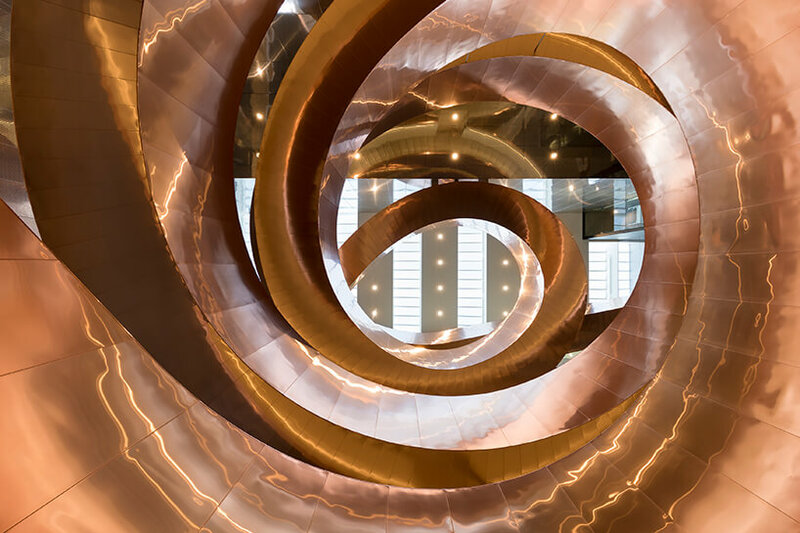 The impressive structure welcomes visitors inside the museum, before spiralling upwards to allow visitors the chance to explore each of the institution’s four storeys. When redesigning the building, there was a focus on becoming a more extroverted building that highlighted the centre as an engaging and vibrant attraction. By adding in a bespoke staircase as the focal point of the design, the centre ensures that this new, exciting vision runs fluidly throughout the floors of the building. The flow of the staircase creates a coherence that connects the floors. Plus, it also supports the scientific ethos of the building as the helix shape of the structure is based on an abstract version of how DNA structure appears. This bronze masterpiece is set in the foyer which is clad with reflective aluminium composite panels so that it’s reflected at all angles.It creates a spectacle as soon as visitors walk into the building and sets the tone for the content of the museum, instantly letting people know that they have entered a world of science and wonder. The staircase acts as a beacon for sparking curiosity whilst giving the museum a bolder and more futuristic aesthetic to attract the younger audience that it craved. If you’re feeling inspired by this stunning and innovative example of staircase design, get in touch today. Jarrods Specialist Carpentry Limited is an Appointed Representative of Shermin Finance Ltd, which is Authorised and Regulated by the Financial Conduct Authority – FRN 727594. Shermin Finance Ltd is a Credit Broker not a lender. They offer Credit Facilities from a panel of Lenders.